We would like to introduce ourselves as trader of various metals, metal scraps and precious metals in Coimbatore, Tamilnadu. 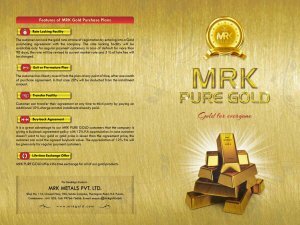 We are looking to offer dealership for MRK Pure gold bars and all of our gold products with the investment of Rs.5 Lakhs. Or If you want to start this business in your own brand name, we can mint and supply the gold bars / coins as per your requirement. We can assist you to start the monthly purchasing plans also to get additional fund flow. Feel free to contact us for your valuable queries, if you are interested. Thank you.